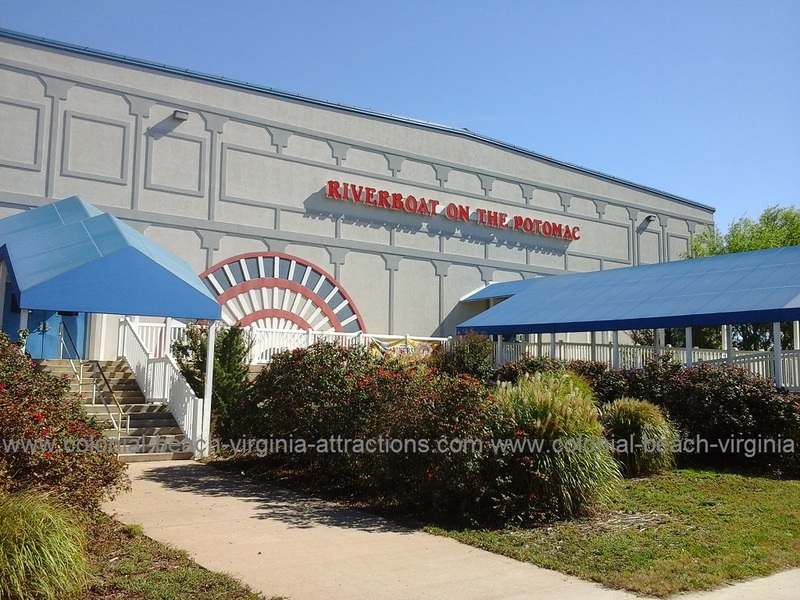 November 2017: New owners have taken the helm at the Riverboat and the parking lot is now paved. Look for other great improvements in the near future like docks so people can arrive by boat and a large outdoor tiki deck! The Riverboat on the Potomac is built out over the water so it's technically in Maryland, as Maryland "owns" the river. Originally known as the wildly popular "Reno" back in the day, it was bought by Tom & Penny Flanagan and they began offering Keno, both Maryland and Virginia lottery, and eventually off-track betting in 1994. Hurricane Isabel dealt a losing hand on September 18, 2003. The place was destroyed. Here's a picture of it. The establishment was rebuilt on the Boardwalk, bigger and stronger than ever, but unfortunately Tom didn't live to see the completion of the new building. All dining rooms, outdoor decks and the upstairs event room have beautiful panoramic views of the Potomac River. There is a dock out back which you can tie up to if arriving by boat. There's even a Maryland ABC store onsite which is open daily from 9:00am to midnight. Slot machines are supposedly going to be installed in this "vessel on the Potomac River" according to Maryland House Bill 647. This referendum is supposed to be voted on in the fall of 2016, which means slots may come in 2017 or 2018. Tuesdays are Prime Rib Night. Enjoy a 10oz Prime Rib cooked the way you like with mashed potatoes, vegetable of the day and a roll for about $10. Karaoke on Fridays in the Tiki Room from 9:00pm to midnight. Come on out and bring your friends to cheer you on. Delicious Sunday Brunch complete with bacon, sausage, eggs, biscuits & gravy, hash browns, pastries, fruit and more! Other special events include Comedy Shows, "Riverboat Idol" singing competitions, Kentucky Derby parties and various fundraisers throughout the year. Newcomers James and Roxanne Santos won a million dollars here in 2013! 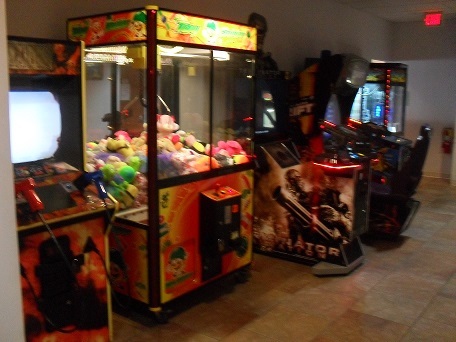 There's a waterview room upstairs with seating for 350 people, so call 804-224-7055 or visit their facebook page if you're looking for a place to hold a beach wedding, family reunion, conference, etc. I have attended a Chamber of Commerce function here and it was a great success. 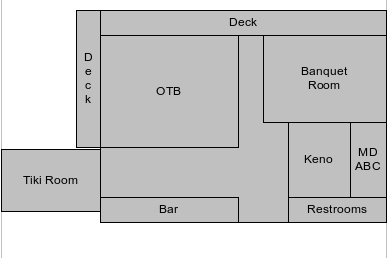 Below is a rough floor plan of the main floor of the place.